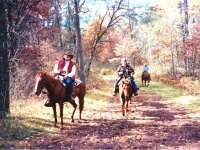 Bicycle and horseback riding are allowed on all Burnett County forest roads, trails, and fire lanes. Riding off-trail is not permitted. These trails are found sporadically throughout our over 111,000 acres of Burnett County Forest Land. Approximately 9 miles east of Danbury, the Big Bear Lake Association maintains a 2-mile walking trail in the Town of Webb Lake. This trail consists of 3 loops which wind through Burnett County Forest Land, and includes educational signs at several points of interest along the trail. The trailhead has a parking lot located on Bear Lake Road approximately 2/10 of a mile north of Lake 26 Road. Timberland Hills offers a 4.4 mile trail for fat bikes, hiking, snowshoeing, and skijoring. This trail uses the county's existing tote road system. The Burnett County segment of the Gandy Dancer State Trail is just over 20 miles, and passes through the communities of Siren, Webster, and Danbury before entering the State of Minnesota segment. From April 1 through November 30 the trail may be used for hiking, biking, and nature study. Horseback riding is not allowed south of Hwy 77 in Danbury. A trail pass must be purchased when biking on the Gandy Dancer Trail. Follow this link for pass information. A map is found by clicking here. Please follow this link for general trail information: Gandy Dancer Trail.